KASCO bread slicing blades for reciprocating blade bread slicers are designed to produce clean, straight, and consistent slices time after time. Our bread slicing blades are ideal for retail and wholesale businesses by reducing bread tearing and crumbing. As a result, there's less bread product waste and a more appealing bread product display. We start with the highest quality steel to produce our durable long-lasting bread slicer blades. Precision grinding then induction hardening the teeth produces a long-lasting and sharp edge. 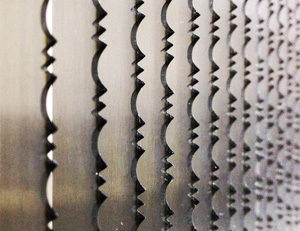 KASCO's Premium Scallop edge bakery and bread slicer blades exceed industry standards for sharpness and durability. KASCO's new ABT bread slicing blades feature a unique scallop + tooth edge designed and engineered to provide a clean and crush-free slice every time. 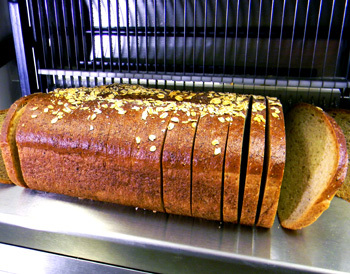 The ABT bread blade is perfect for a wide variety of retail and wholesale bread slicing applications including crusty, hearty, nutty, and full grain. Even warm sourdough loaves do not crush when sliced with KASCO ABT bread slicer blades. 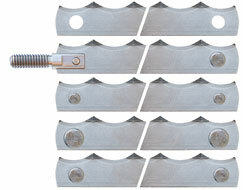 Premium Scallop edge and ABT edge reciprocating bread slicing blades are available in a wide selection of lengths and end fittings to fit most commercial bread slicing machines, including Oliver, Berkel, JAC and Doyon. All reciprocating bakery & bread slicing blades are cut to the exact length with precision hole, pin, rivet or threaded fastener placement for exact fit in machines from manufacturers such as Oliver, Berkel, JAC and Doyon. We recommend replacing the bread slicing blades on your slicers every 6 to 12 months, depending on the volume of bread you slice. Regularly scheduled bread slicing blade replacement is available from professional certified KASCO technicians. KASCO also provides retail and wholesale bread slicer and bakery equipment repair and maintenance. We service many makes and models of retail and wholesale bakery equipment. Contact KASCO for more information on our blade replacement program, or equipment maintenance and repair for bakeries.